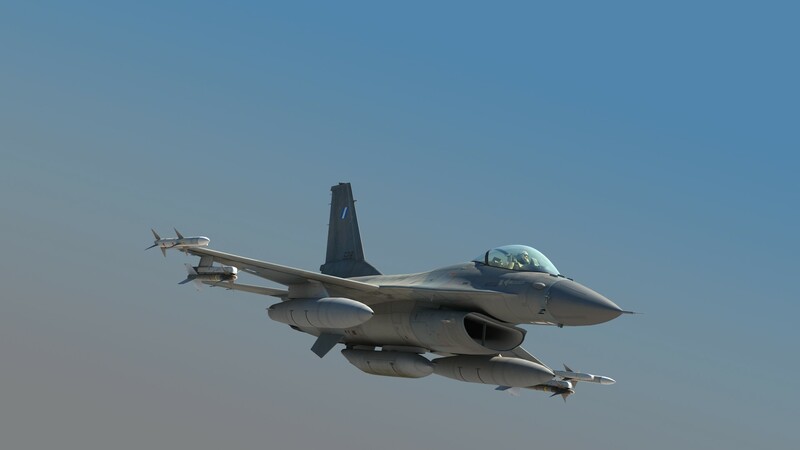 Just a nice rendering of the F-16 we released last year. We needed this image for promotional purposes and it's so nice we thought, why not show you. It also shows what kind of data is actually in the files we make, you see FSX does not do it fully justice. That render makes my paintwork look almost real Damn, if FSX only could render like that. Perhaps with the new Aerosoft Flight Sim...? So close to real it is not funny. It's a render, or real life I don't know they might be pulling our finger on this one. No it's a straight 3dMax render (no tweaking). But an ideal graphics engine would show it just like that as it shows the actual source data. When it comes to working with 3DSMax does it make much difference if you use an ATI card vs an Nvidia? A stunning piece of art work, when you get the scene and lighting right in Max it produces wonderful images. In 3dMax? No not really. Great model :-) It takes a little time for 3DMax to render that though, not much though. Thanks for sharing the render, it shows more of the quality work and processes behind the scenes. What the F-16 textures sadly lack is the shadow texture "baking" feature so prominent on the PBY. This would enhance the F-16 model appearance immensly. I understand a light source is shone on the model in 3DSM and the resulting "shadows" can be saved as a layer in psd format. Only task left to do then is to incorporate that layer onto 50+ texture sets, probably a years work..... :-) It sure would make the F-16 great looking though.